Yesterday’s rebound in the US dollar translated into a further squeeze higher for the usd to cad currency pair, ending the day with a wide spread up bar and closing above both the 9 and 14 day moving averages but well below the 40 day and well within acceptable retracement levels. 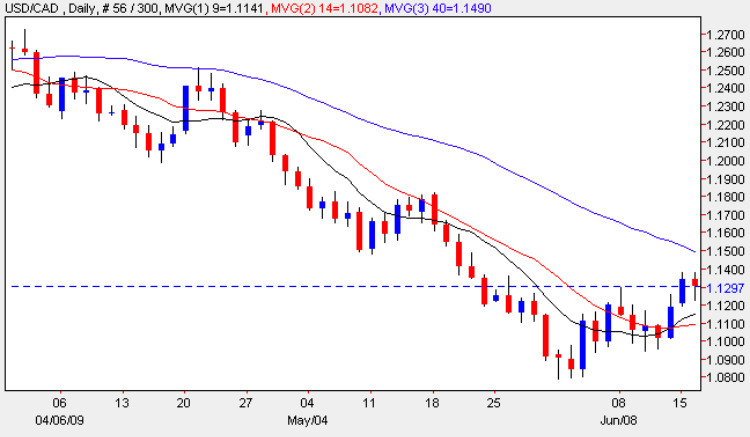 Whether this squeeze higher continues in the medium term will depend on several factors, not least a break and hold above the 40 day moving average which may be coupled with a breach of the strong resistance now in place immediately ahead in the 1.15 region. If these two factors combine then we could see a move higher, possibly as far as 1.17. Items of fundamental news on the economic calendar today for Canada was the change in labour efficiency figures which came in worse than expected at 0.3% against a forecast -0.2% whereas for the US we have had a whole raft of data, details of which can be found on the eurodollar site.